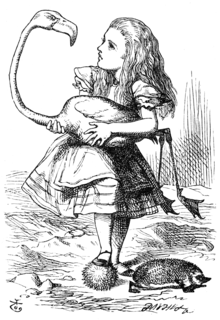 An illustration from Lewis Carroll's Alice's Adventures in Wonderland, depicting the fictional protagonist, Alice, playing a fantastical game of croquet. This article is about the type of media content. For other uses, see Fiction (disambiguation). Fiction broadly refers to any narrative that is derived from the imagination — in other words, not based strictly on history or fact. It can also refer, more narrowly, to narratives written only in prose (the novel and short story), and is often used as a synonym for the novel. In cinema it corresponds to narrative film in opposition to documentary as far as novel to feature film and short story to short film. In its most narrow usage fiction refers to novels, but it may also denote any "literary narrative" (see literary fiction), including novels, novellas, and short stories. More broadly, fiction has come to encompass imaginative storytelling in any format, including writings, theatrical performances, comics, films, television programs, animations, games (most notably, video games and role-playing games), and so on. Traditionally, fiction includes novels, short stories, fables, legends, myths, fairy tales, epic and narrative poetry, plays (including operas, musicals, dramas, puppet plays, and various kinds of theatrical dances). However, fiction may also encompass comic books, and many animated cartoons, stop motions, anime, manga, films, video games, radio programs, television programs (comedies and dramas), etc. The Internet has had a major impact on the creation and distribution of fiction, calling into question the feasibility of copyright as a means to ensure royalties are paid to copyright holders. Also, digital libraries such as Project Gutenberg make public domain texts more readily available. The combination of inexpensive home computers, the Internet and the creativity of its users has also led to new forms of fiction, such as interactive computer games or computer-generated comics. Countless forums for fan fiction can be found online, where loyal followers of specific fictional realms create and distribute derivative stories. The Internet is also used for the development of blog fiction, where a story is delivered through a blog either as flash fiction or serial blog, and collaborative fiction, where a story is written sequentially by different authors, or the entire text can be revised by anyone using a wiki. Novella: A work of at least 7,500 words but under 50,000 words. Joseph Conrad's Heart of Darkness (1899) is an example of a novella. Fiction is commonly broken down into a variety of genres: subsets of fiction, each differentiated by a particular unifying tone or style, narrative technique, media content, or popularly defined criterion. Science fiction, for example, predicts or supposes technologies that are not realities at the time of the work's creation: Jules Verne's novel From the Earth to the Moon was published in 1865 and only in 1969 did astronaut Neil Armstrong first land on the moon. Historical fiction places imaginary characters into real historical events. In the early historical novel Waverley, Sir Walter Scott's fictional character Edward Waverley meets a figure from history, Bonnie Prince Charlie, and takes part in the Battle of Prestonpans. Some works of fiction are slightly or greatly re-imagined based on some originally true story, or a reconstructed biography. Often, even when the fictional story is based on fact, there may be additions and subtractions from the true story to make it more interesting. An example is Tim O'Brien's The Things They Carried, a series of short stories about the Vietnam War. Fictional works that explicitly involve supernatural, magical, or scientifically impossible elements are often classified under the genre of fantasy, including Lewis Carroll's Alice In Wonderland, J. K. Rowling's Harry Potter series, and J. R. R. Tolkien's The Lord of the Rings. Creators of fantasy sometimes introduce imaginary creatures and beings such as dragons and fairies. Literary fiction is a term used in the book-trade to distinguish novels that are regarded as having literary merit, from most commercial or "genre" fiction. Neal Stephenson has suggested that while any definition will be simplistic there is today a general cultural difference between literary and genre fiction. On the one hand literary authors nowadays are frequently supported by patronage, with employment at a university or a similar institution, and with the continuation of such positions determined not by book sales but by critical acclaim by other established literary authors and critics. On the other hand, he suggests, genre fiction writers tend to support themselves by book sales. However, in an interview, John Updike lamented that "the category of 'literary fiction' has sprung up recently to torment people like me who just set out to write books, and if anybody wanted to read them, terrific, the more the merrier. ... I'm a genre writer of a sort. I write literary fiction, which is like spy fiction or chick lit". Likewise, on The Charlie Rose Show, he argued that this term, when applied to his work, greatly limited him and his expectations of what might come of his writing, so he does not really like it. He suggested that all his works are literary, simply because "they are written in words". Literary fiction often involves social commentary, political criticism, or reflection on the human condition. In general it focuses on "introspective, in-depth character studies" of "interesting, complex and developed" characters. This contrasts with genre fiction where plot is the central concern. Usually in literary fiction the focus is on the "inner story" of the characters who drive the plot, with detailed motivations to elicit "emotional involvement" in the reader. The style of literary fiction is often described as "elegantly written, lyrical, and ... layered". The tone of literary fiction can be darker than genre fiction, while the pacing of literary fiction may be slower than popular fiction. As Terrence Rafferty notes, "literary fiction, by its nature, allows itself to dawdle, to linger on stray beauties even at the risk of losing its way". In terms of the traditional separation between fiction and non-fiction, the lines are now commonly understood as blurred, showing more overlap than mutual exclusion. Even fiction usually has elements of, or grounding in, truth. The distinction between the two may be best defined from the perspective of the audience, according to whom a work is regarded as non-fiction if its people, places, and events are all historically or factually real, while a work is regarded as fiction if it deviates from reality in any of those areas. The distinction between fiction and non-fiction is further obscured by an understanding, on the one hand, that the truth can be presented through imaginary channels and constructions, while, on the other hand, imagination can just as well bring about significant conclusions about truth and reality. Literary critic James Wood, argues that "fiction is both artifice and verisimilitude", meaning that it requires both creative invention as well as some acceptable degree of believability, a notion often encapsulated in poet Samuel Taylor Coleridge's term: willing suspension of disbelief. Also, infinite fictional possibilities themselves signal the impossibility of fully knowing reality, provocatively demonstrating that there is no criterion to measure constructs of reality. ^ As philosopher Stacie Friend explains, "in reading we take works of fiction, like works of non-fiction, to be about the real world—even if they invite us to imagine the world to be different from how it actually is. [Thus], imagining a storyworld does not mean directing one's imagining toward something other than the real world; it is instead a mental activity that involves constructing a complex representation of what a story portrays". ^ The research of Weisberg and Goodstein (2009) revealed that, despite not being specifically informed that, say, the fictional character Sherlock Holmes, had two legs, their subjects "consistently assumed that some real-world facts obtained in fiction, although they were sensitive to the kind of fact and the realism of the story." ^ M. H. Abrams, A Glossary of Literary Terms (7th edition). Fort Worth, TX: Harcourt Brace, 1999, p. 94. ^ "Definition of 'fiction'." Oxford English Dictionaries (online). Oxford University Press. 2015. ^ Farner, Geir (2014). "Chapter 2: What is Literary Fiction?". Literary Fiction: The Ways We Read Narrative Literature. Bloomsbury Publishing USA. ^ Iftekharuddin, Frahat (ed.). (2003). The Postmodern Short Story: Forms and Issues. Greenwood Publishing Group. p. 23. ^ Jones, Oliver. (2015). "Why Fan Fiction is the Future of Publishing." The Daily Beast. The Daily Beast Company LLC. ^ Milhorn, H. Thomas. (2006). Writing Genre Fiction: A Guide to the Craft. Universal Publishers: Boca Raton. pp. 3–4. ^ J. A. Cuddon, The Penguin Dictionary of Literary Terms (1992). London: Penguin Books, 1999, p. 600. ^ Whiteman, G.; Phillips, N. (13 December 2006). "The Role of Narrative Fiction and Semi-Fiction in Organizational Studies". ERIM Report Series Research in Management. ISSN 1566-5283. SSRN 981296. ^ Saricks 2009, pp. 181–82. ^ Coles 2007, p. 26. ^ Friend, Stacie (2017). "The Real Foundation of Fictional Worlds" (PDF). Australasian Journal of Philosophy. 95: 29–42. doi:10.1080/00048402.2016.1149736. ^ Weisberg, D.S. & Goodstein, J., "What Belongs in a Fictional World? ", Journal of Cognition and Culture, Vol. 9, No. 1, (March 2009), pp. 69–78. ^ Wood, James. 2008. How Fiction Works. New York. Farrar, Straus & Giroux. p. xiii.